A new partnership involving University of Plymouth's Catering Services is set to provide food to some of the most vulnerable sections of the community. The team, which runs the cafes on the city centre campus, has signed up to a programme run by the Devon and Cornwall Food Association (DCFA) that takes surplus food that would otherwise end up going to landfill and redistributes it to people in need. 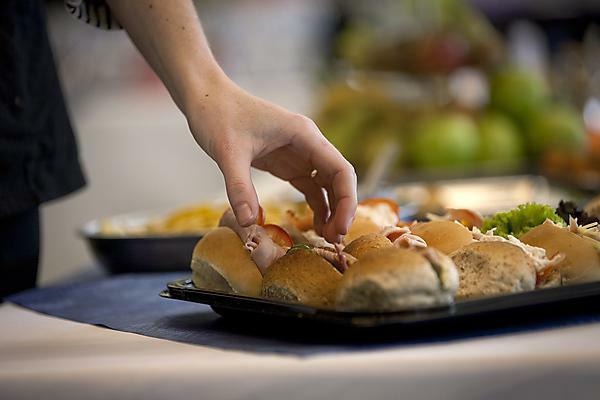 Ian Gribben, Commercial Services Director, University Commercial Services Plymouth at University of Plymouth, said the new initiative offered a more sustainable way to dispose of food and would further contribute to the University’s sustainability agenda. The food, which includes surplus, short-date and end-of-line stocks is collected from the campus twice a week, and after just two months, the University has donated £3,000 worth of stock, which equates to around 2000 portions of food and £1200 of equipment. The University has recently been named a ‘Three Star Sustainability Champion’ by the Sustainable Restaurant Association, received a Good Egg Award, presented by Compassion in World Farming in recognition of sourcing only cage-free eggs, a Food For Life Bronze Award for the second year in a row for preparing our food fresh and on-site, and Fairtrade Status, in support of fair conditions and prices for farmers and workers in developing countries. It has also been shortlisted for the very first Freefrom Eating Out Awards. Winners of this national competition, run by Food Matters Live, will be revealed at a special ceremony at London’s Docklands in November.